This will make for some easy to make inventory screens, especially when you have custom items. This should still work on SurfaceGuis if the SurfaceGui isn’t in workspace (and uses Adornee). The semantics of parts-inside-surfacegui-inside-workspace where parts are kinda in workspace but kinda aren’t were very unclear so for now we disabled rendering of viewportframe if it’s in workspace. You can set the backgroundcolor of the viewport frame to the same color as whatever you’re placing it on to fix that. How resource intensive is the ViewportFrame compared to an ImageLabel? If you take a look at the tweet I linked, you’ll see why that doesn’t work. Plus, what even is the color of the weapon from? The sky? If that’s the case, a single color won’t work (although it will reduce how noticeable the outline is). Any plans to support particles in this in the near future? Yes yes beautiful, but GifFrames when? 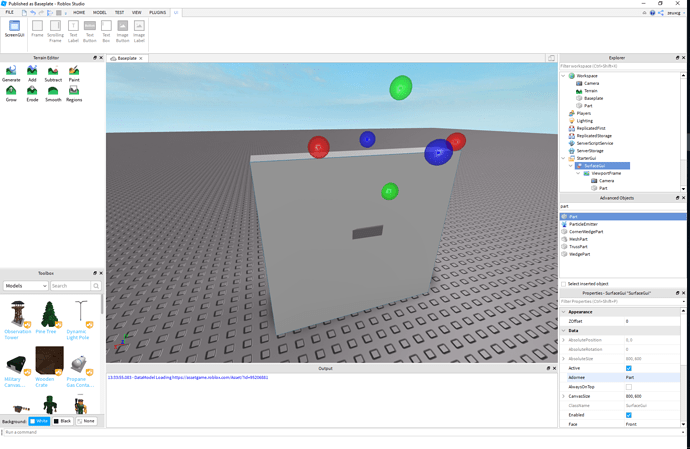 Will we see the addition of multiple cameras to Roblox such to allow things like multiplayer games and different views? This is such an amazing addition. I already know that a lot of really awesome things will be made with it. Imagine Rocket League splitscreen or something in Roblox. Or imagine a ViewportFrame except it can see the entire environment and not just a specific object. OMG YESS!!! I HAVE BEEN DREAMING OF SOMETHING LIKE THIS FOR SO LONG!! Saves me from making 100 decals for shops!! Awesome stuff, can’t wait to use it! I can’t wait for it to support particle emitters! I’m in love with this new update! So happy it’s finally released!